In Chapter Three of the Yoga Sutras, “Vibhuti Padah,” Patanjali defines meditation as sustained concentration. Meditation is both a process and a state of being. Simply put, it is moving from distraction to attention, to sustained attention or concentration. 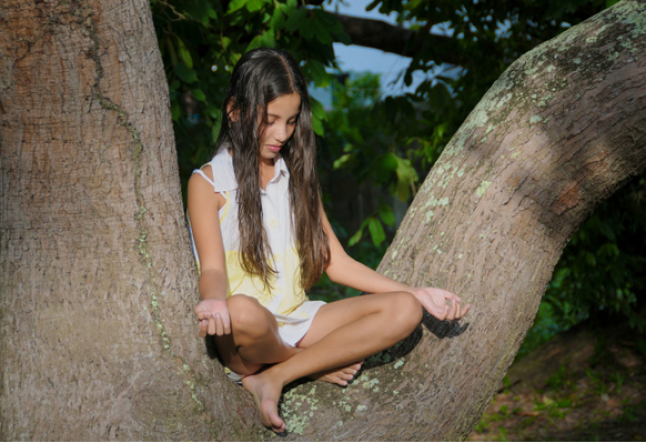 As children learn about their bodies through yoga postures, they learn about their minds through meditation. They learn that they can control their thought patterns, their emotions and their well-being. Meditation begins with breath awareness. Sit in front of your child. Close your eyes and open your ears. Gently massage and squeeze your ears and ear lobes. Ask your child to listen to the sound of her breath. Ask her to describe her breath: Is it long or short? Deep or shallow? Soft or loud? Sit quietly and count to ten aloud; then count to ten silently. Or, count ten cycles of breath. Experiment: count your exhales aloud, or count silently to yourself. Sound is natural extension of the breath. Children love sound and song. A Mantra is a sacred word or sound used as an object of meditation. Mantras are believed to have healing and transformative powers. Chanting a mantra is a means to develop breath awareness. The use of sound regulates the breath, deepens exhalation and focuses attention. “Om shanti” or “Om peace” is a simple mantra that children can easily identify with. Begin in a comfortable seated position, and ask your child what peace means to her. Begin chanting, and ask your child to repeat after you. Make up your own variation of this mantra, interchanging the words or quickening the pace to improve your child’s focus, concentration and memory. Clapping and tapping (if your child is under eight) develops coordination between breath and movement – another step towards concentration. Vary the rate and speed of your clapping as well as the pitch and volume of your voice for different effects. Having your child chant softly or silently will draw your child’s attention inward. An affirmation, such as “I am peaceful,” “I am quiet,” or “I am calm,” may be used instead of a mantra. Yantras are ancient geometrical designs. Yantras may be simple in design, or a complex combination of dots, triangles and hexagrams arranged to promote such things as health, prosperity and protection. With construction paper and imagination, create a yantra with your child. Draw a large dot in the center of a large piece of paper. Arrange various colored shapes (red, orange and yellow are common yantra colors) around the center dot. What will this yantra be used for? Courage? Stillness? Love? Sit with your child in front of your yantra. Focus on the center of the image. As your mind quiets, extend your focus and awareness out towards the edges of the yantra. Focus on the entire pattern. Close your eyes and visualize your yantra in your mind’s eye. A Mandala is also a diagram used as an object of meditation. It may be brightly colored; it has a center, cardinal points contained within a circle and some form of symmetry and design. Ask your child to look for mandalas in nature, starting with the very large Mother Earth and ending with the very small iris of her eye, naming all the circles in between: the sun, a bicycle wheel, or a blueberry pie to name a few. Have your child make her own Mandala with crayons, markers, colored chalk or colored sand. Encourage her to look at it when she is feeling anxious or needs time to herself. Or, read a book with your child. Having your child listen to a story is the beginning of meditation: it is sitting still, listening, paying attention and concentrating.